Прототип Spitfire, K5054, пилотируемый шеф-пилотом Саммерсом, впервые поднялся в воздух 5 моя 1936 года с аэродрома Истли около Саутгемптона. За последующие три года этот самолет налетал около 260 часов. Его карьера закончилась 4 сентября 1939 года, когда при посадке самолет перевернулся, погиб пилот - флайт-лейтенант Уайт. После этой катастрофы машину не восстанавливали. Back on the ground, K5054 shows off its distinctive profile to Flight’s photographer, with finer-pitch propeller and after modification of the rudder balance. 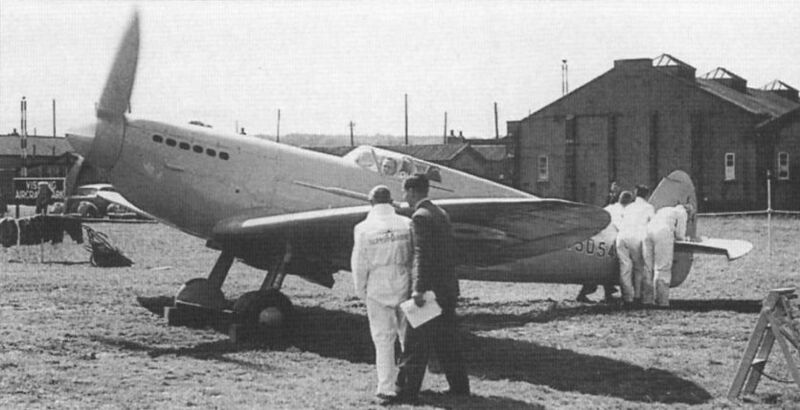 The Spitfire prototype running-up at Brooklands on June 30, 1936 with Mutt Summers at the controls. The aircraft was taking part in a pre-RAF Pageant show. K5054 at Eastleigh on May 18, 1936. Note the additional hinged wheel covers, which were later abandoned, and the flush exhausts. K5054, now wearing camouflage, photographed on a January night in 1938 with Jeffrey Quill in the cockpit. Night flying trials at the A&AEE were generally satisfactory. 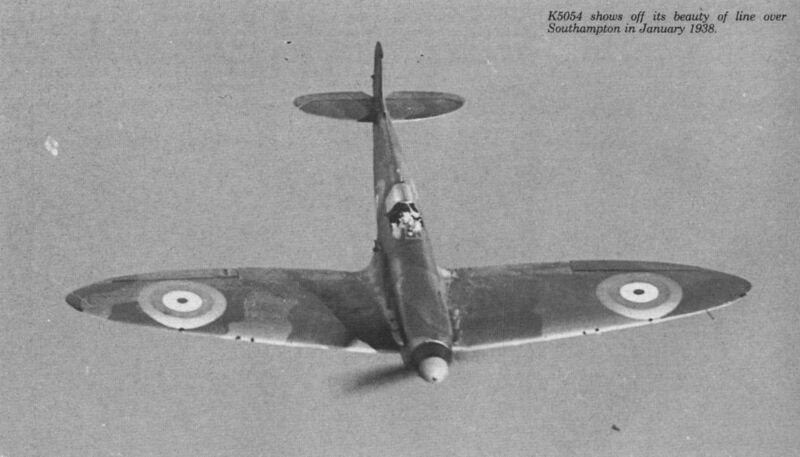 K5054 shows off its beauty of line over Southampton in January 1938. 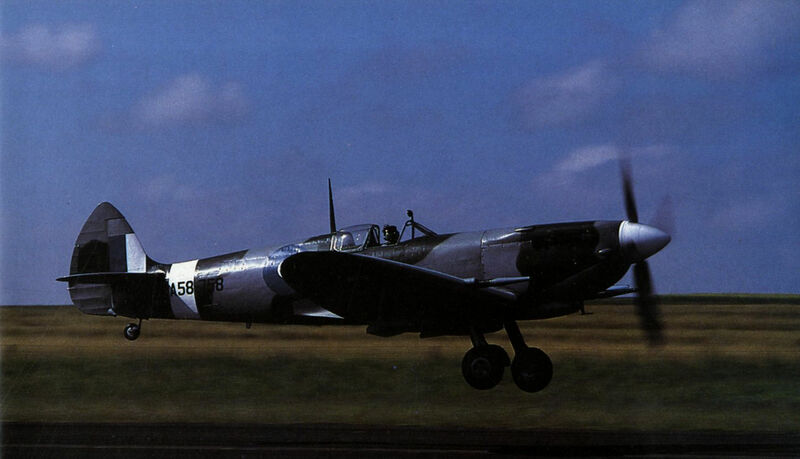 Spitfire HF.VIII A58-758/MV239 shortly after lifting off on its first flight at Scone, NSW, Australia on December 29, 1985. 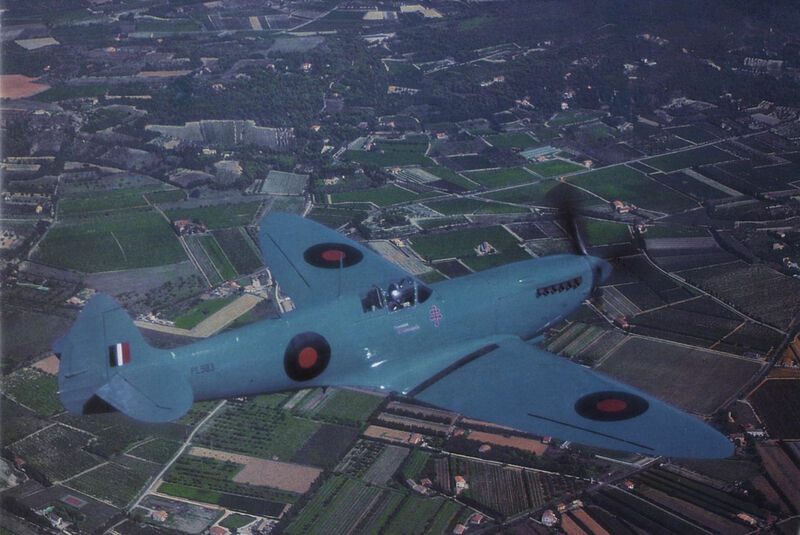 This aircraft, owned by Col Pay, is the first Spitfire to fly in Australia since the end of World War Two. Roland Fraissinet's Spitfire PR.XI PL983/G-PRXI, photographed over France last summer.